Brian Donohue, New Jersey-born software engineer and former CEO of Instapaper, wasn't an immediate Alexa fan. In fact, his first reaction to the 2014 announcement of the Amazon Echo was "That's cool, but why would I buy one?" All that changed over the course of one whirlwind weekend in March 2016. Almost overnight, Brian went from almost indifferent to being one of the most active developers in the Alexa community. Today he’s recognized as an Alexa Champion and a master organizer of Alexa meetups. We sat down with Brian to find out how Alexa changed his entire view of voice technology... and why he wanted to share his excitement with other Alexa developers. Brian has led Instapaper for the last two and a half years. Its former owner, Betaworks, always encouraged employees—including Brian—to check and innovate with new technology. Brian has built apps for Google Glass and other devices, just because the company had them lying around the office. When the company bought an Echo device in March, Brian had to take another look. He took it home one Friday night and decided to try building a skill using the Alexa Skills Kit (ASK). He selected something simple, inspirational and personal to him. The skill—which later became Nonsmoker—keeps track of when you stopped smoking and tells you how long it's been since your final cigarette. The first version took Brian half a day to create. It was full of hardcoded values, but it was empowering. Then, in playing with this and other Alexa skills, Brian recognized something exciting. A fundamental technology shift was staring right at him. When he returned the Echo to the office on Monday, he was hooked. Brian wanted immediate and more active involvement in Alexa development. The following day he was searching meetup.com for Alexa user gatherings in New York City. He found none, so Brian did what always came naturally. He did it himself. His goal was to find 20 or so interested people before going to the effort of creating a meetup. The demand was far greater than he expected. By the third week of March, he was hosting 70 people at the first-ever NYC Amazon Alexa Meetup, right in the Betaworks conference room. After a short presentation about Echo, Tap and Dot, Brian did the rest of the program solo. He created a step-by-step tutorial with slides, a presentation and code snippets, all to explain how to create a simple Alexa skill. He walked attendees through the program, then let them test and demo their skills on his own Echo, in front of the class. “A lot of them weren’t developers, but they could cut and paste code,” says Brian. “About half completed the skill, and some even customized the output a bit.” Brian helped one add a random number generator, so her skill could simulate rolling a pair of dice. 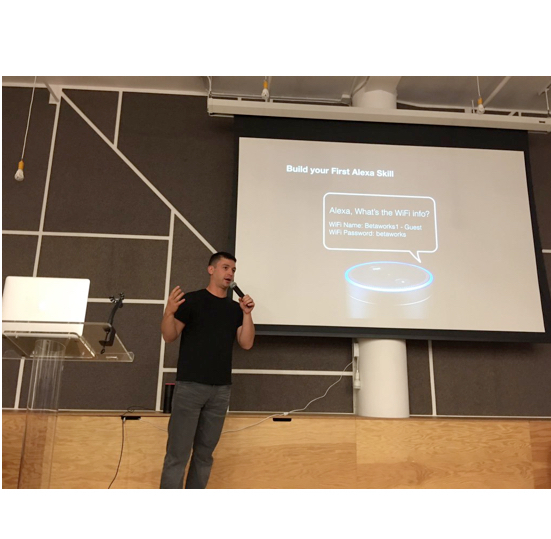 Brian polished his Build Your First Alexa Skill presentation and led two more meetups in New York. Amazon hosted the third one—with 90 attendees—at its AWS Popup Loft in SoHo. Pinterest purchased Brian’s startup, Instapaper, in August, and Brian found himself moving to San Francisco. He left the NYC Alexa meetup group in the capable hands of Ruthie Nachmany, a software engineer and Brian’s meetup co-organizer. But that wasn’t the end for the Master of Alexa meetups. Even before moving from one coast to the other, Brian checked for Alexa meetups in the Bay Area. Right away he attended the Amazon Alexa San Francisco meetup. His timing was perfect. It turned out the organizers were in the US on tourist visas and were preparing to return home to France. A couple of days later, they asked Brian to take over the reins, and they stepped down. Brian has found a new home in San Francisco, in more ways than one. Learn more about Brian Donohue and other Alexa Champions.